Some of us remember—and some of us have read about—the first televised presidential debate between Richard Nixon and John F. Kennedy, Jr. in 1960. At a time when television was cutting-edge technology, it can be argued that Nixon lost that debate, and subsequently the election, because of how he appeared to the public on the medium. Fast forward to 2012, another election year. Right now, there is activity from all presidential candidates as @MittRomney, @NewtGingrich, @RonPaul, @BuddyRoemer, @fredkarger and @RickSantorum are all pushing their campaign platforms virally (and don’t forget about President @BarackObama…he’s on top of it, as well). Will this be the year that social media decides who becomes President? But what constitutes a better social media presidential campaign? More tweets than the competition? Quality of tweets over quantity? Number of followers? Strategic mudslinging in 140 characters or less? Is it really that important for a candidate to have a social media voice? According to a May 2011 study by Social Vibe, a whopping 94 percent of social media users of voting age watched a political message in its entirety on a social media site. Still don’t think social media is that important? Consider that 39 percent of those same folks shared the message they watched with an average of 130 other users. (Remember exponents from high school math? The numbers start to add up pretty quickly.) But are those 39 percent just sharing with each other? 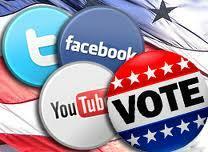 Can social media really convert followers into voters? For more information on this year’s presidential candidates and their social media presence, follow this link: http://2012twit.com/.